Admired by his contemporaries as a natural politician, Jeremiah Haralson made his reputation in Alabama politics as a powerful orator and an adroit debater. Black civil rights advocate Frederick Douglass observed that Haralson spoke “with humor enough in him to supply a half dozen circus clowns.”1 However, a Democratic majority during his single congressional term tempered his public wit; he made no speeches on the House Floor. Haralson’s unsuccessful re–election campaign in 1876 set off a series of difficult and fruitless attempts to regain his seat in the Jim Crow South, ending a political career marked by mystery and contradiction. Jeremiah Haralson was born a slave near Columbus, Georgia, on April 1, 1846. His early life is not well documented. He was sold twice as a child before John Haralson, a lawyer from Selma, Alabama, purchased him in 1859. After winning his freedom in 1865, Jeremiah Haralson taught himself to read and write. He made his living as a farmer and may also have been a clergyman.2 Haralson married Ellen Norwood in 1870 and had one son, Henry. Bromberg contested Haralson’s victory. In delivering the decision of the Committee on Elections on April 18, 1876, Democratic Chairman John Harris of Virginia informed his colleagues that their investigation uncovered “frauds as flagrant and abuses as violent as ever have been committed in this country upon the elective franchise.”15 Harris flailed the district’s Republicans for controlling voters with money appropriated for helping freedmen, noting that more “colored voters were intimidated by their own race against voting for [Bromberg],” than were hassled by white supremacists. The committee declared some of Haralson’s votes invalid, but the black Representative retained a secure margin over Bromberg. The committee ruled unanimously to reject Bromberg’s challenge, a decision sustained by the House.16 Haralson received a single assignment: to the Committee on Public Expenditures. Radical Republicans from Haralson’s district frowned on his friendships with former Confederate President Jefferson Davis, and southern Democratic Senators Lucius Q. C. Lamar of Mississippi and John Gordon of Georgia. Haralson rebuffed Radical Republican scorn by accusing white members of his own party of conspiring against African–American voters. “We must drive out these hell hounds and go in for peace between the two races in the South,” he noted in a January 29, 1876, statement.17 As the contentious 1876 election promised violence in the South, he broke with the Republican Party by criticizing the use of federal soldiers to police polls and ensure orderly voting. Haralson claimed their presence would hurt the Republican Party, telling a southern Democratic newspaper “every blue jacket sent to the South makes Democratic votes.”18 During his term, he introduced legislation to use the proceeds from the sale of public land for education, although he favored strict segregation of the races, particularly in public schools. He also presented a petition from citizens in Mobile, Alabama, requesting compensation for the use of a medical college and supplies by officers of the Freedmen’s Bureau. None of the bills proposed by Haralson passed. 1Eric Foner, Freedom’s Lawmakers: A Directory of Black Officeholders During Reconstruction (New York: Oxford University Press, 1993): 95. 2Maurine Christopher, Black Americans in Congress (New York: Thomas Y. Crowell Company, 1976): 132; Stephen Middleton, ed., Black Congressmen During Reconstruction: A Documentary Sourcebook (Westport, CT: Praeger, 2002): 115. 3Quoted in Christopher, Black Americans in Congress: 132. 4Loren Schweninger and Alston Fitts III, “Haralson, Jeremiah,” American National Biography 10 (New York: Oxford University Press, 1999): 37–38 (hereinafter referred to as ANB). 5Christopher, Black Americans in Congress: 132. 6Bruce A. Ragsdale and Joel D. Treese, Black Americans in Congress, 1870–1989 (Washington, DC: Government Printing Office, 1990): 63; Christopher, Black Americans in Congress: 132; Middleton, ed., Black Congressmen During Reconstruction:166. Article I, Section 2 of the U.S. Constitution states that no one under the age of 25 may be seated in the U.S. House of Representatives. Michael Dubin makes no mention of Haralson’s candidacy for the 1868 general election; it is likely that Haralson never received the party nomination. See Michael J. Dubin et al., U.S. Congressional Elections, 1788–1997 (Jefferson, NC: McFarland & Company, Inc., Publishers, 1998): 213. 7Schweninger and Fitts, “Haralson, Jeremiah,” ANB. 8Christopher, Black Americans in Congress: 132–133. 9Haralson’s civil rights bill was subsequently abandoned by the state house of representatives. See Schweninger and Fitts, “Haralson, Jeremiah,” ANB. Quoted in Christopher, Black Americans in Congress: 134, and Middleton, ed., Black Congressmen During Reconstruction:116. 10Schweninger and Fitts, “Haralson, Jeremiah,” ANB. 11Quoted in Foner, Freedom’s Lawmakers: 95, and Middleton, ed., Black Congressmen During Reconstruction: 116. 12Schweninger and Fitts, “Haralson, Jeremiah,” ANB. 13Stanley B. Parsons et al., United States Congressional Districts, 1843–1883 (New York: Greenwood Press, 1986): 146. 14Dubin et al., U.S. Congressional Elections, 1788–1997: 230. 15Congressional Record, House, 44th Cong., 1st sess. (18 April 1876): 2552. 16Congressional Record, House, 44th Cong., 1st sess. (23 March 1876): 1913; Congressional Record, House, 44th Cong., 1st sess. (18 April 1876): 2552; Chester H. Rowell, A Historical and Legal Digest of All the Contested Election Cases (Washington, DC: Government Printing Office, 1901): 303. 17Quoted in Middleton, ed., Black Congressmen During Reconstruction: 117. 18Quoted in Christopher, Black Americans in Congress: 135. 19According to Loren Schweninger’s biography of Representative James Rapier, Haralson withdrew from the race before the election. However, Haralson appears in the election results and split the Republican ticket with Rapier. See Loren Schweninger, James T. Rapier and Reconstruction (Chicago: University of Chicago Press, 1978); Dubin et al., U.S. Congressional Elections, 1788–1997: 236. 20Schweninger, James T. Rapier and Reconstruction: 157. 21“Jere Haralson’s Case: The Colored Statesman Puts a Few Points to the Public,” 10 April 1878, Washington Post: 2. 22Congressional Record, House, 45th Cong., 2nd sess. (16 April 1878): 2580. This case is not included in Rowell’s A Historical and Legal Digest of All the Contested Election Cases. There has been considerable discussion among scholars as to the outcome of Haralson’s contested election to the 45th Congress (1877–1879). Some sources indicate that the Committee on Elections ruled for Haralson in the 45th Congress but that Congress adjourned before he was seated. See Schweninger and Fitts, “Haralson, Jeremiah,” ANB; Foner, Freedom’s Lawmakers: 94. Others confirm that the committee ruled for seating Representative Charles Shelley. See Ragsdale and Treese, Black Americans in Congress, 1870–1989: 64. Contemporary accounts, however, suggest the committee never considered or ruled on Haralson’s claim; see, for instance, “Wasting Time In Congress,” 14 May 1878, New York Times: 1. The most likely result of Haralson’s election contest can be inferred from congressional sources: The Congressional Record notes that Haralson’s claim was reported to the Committee on Elections, but there is no mention of a decision. TheBiographical Directory of the United States Congress, 1774–Present confirms that Representative Charles Shelley was elected fairly to the 45th Congress; see “Shelley, Charles Miller,” available at http://bioguide.congress.gov/scripts/biodisplay.pl?index=S000326. Finally, Dubin et al., U.S. Congressional Elections, 1788–1997: 236, contains no mention of a successful challenge to Shelley’s seat in the 45th Congress. 23“Alabama,” 14 October 1878, Chicago Tribune: 2. 24“Independents in Alabama,” 3 November 1878, New York Times: 1. 25Dubin et al., U.S. Congressional Elections, 1788–1997: 243. 26“Washington,” 6 June 1876, New York Times: 5. 27“How a Southern Republican Was Cheated Out of His Seat,” 2 February 1880, Chicago Daily Tribune: 4. 28Congressional Record, House, 46th Cong., 2nd sess. (31 January 1880): 633; “Keifer, Joseph Warren,” Biographical Directory of the United States Congress, 1774–Present, available at http://bioguide.congress.gov/scripts/biodisplay.pl?index=K000048. 29Congressional Record, House, 46th Cong., 2nd sess. (31 January 1880): 634. 30The case does not appear in Rowell’s, A Historical and Legal Digest of All the Contested Election Cases; see also Congressional Record Index, 46th Congress, three sessions. 31Stanley B. Parsons et al., United States Congressional Districts, 1883–1913 (New York: Greenwood Press, 1990): 3. 32Dubin et al., U.S. Congressional Elections, 1788–1997: 264. 33See Congressional Record Index, 49th Congress, both sessions. 34Christopher, Black Americans in Congress: 136. Papers: In the Reconstruction Era Political Materials, 1868-1878, 0.33 cubic foot. Other authors include Jere Haralson. Papers: 1876, 1 item. A letter from Jere Haralson to the United States Centennial Commission in Philadelphia, Pennsylvania written on April 27, 1876. In the letter, Haralson requests an additional invitation for his wife to attend the opening of the Centennial International Exhibition of Industry. 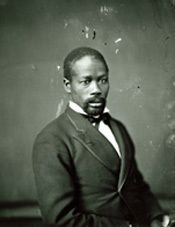 "Jeremiah Haralson" in Black Americans in Congress, 1870-2007. Prepared under the direction of the Committee on House Administration by the Office of History & Preservation, U.S. House of Representatives. Washington: Government Printing Office, 2008.